Why is white smoke coming from my exhaust pipe? A car’s exhaust can tell you a lot about the state of your vehicle (and about its impact on the environment). Things can be running seemingly fine everywhere else, but smoke from the exhaust can tell a whole other story. Different coloured exhaust smoke is one of the biggest signs that you have a problem somewhere, but which colour relates to what problem and what exactly should you do about it? This short blog series is going to be about the causes and remedies of white, blue, and black smoke from your engine exhaust. Today we take a look at white smoke, what causes it, and how to fix it. White smoke can be nothing to be concerned about, but only if it is thin (like vapour) and it dissipates quickly. This is probably the result of normal condensation buildup inside the exhaust system. 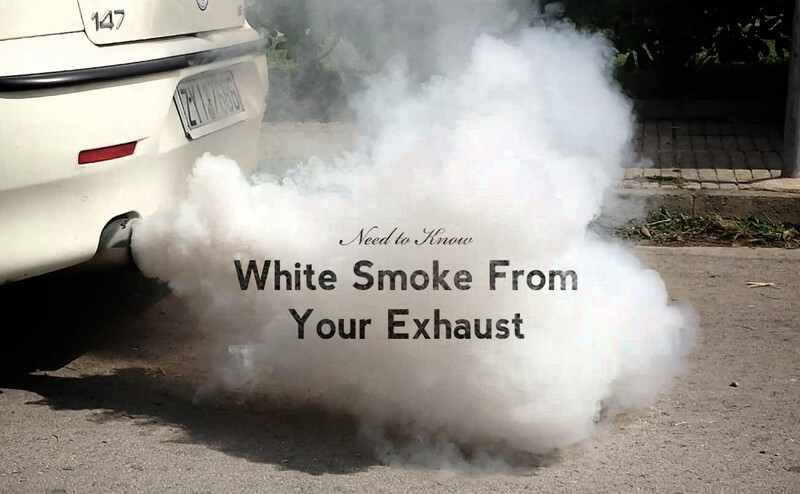 However, thick clouds of white smoke represent a real problem, and can be caused the engine burning coolant. This can be the result of a serious issue like a blown head gasket, a damaged cylinder head, or a cracked engine block – all of which are costly repairs. If the plumes of smoke are voluminous, you should give your mechanic a call right away. If you think the smoke is gradually increasing, it might be a good time to schedule your next regular oil change and maintenance and ask your mechanic to check it out at the same time. It is always best to stay out in front of these things if you can.